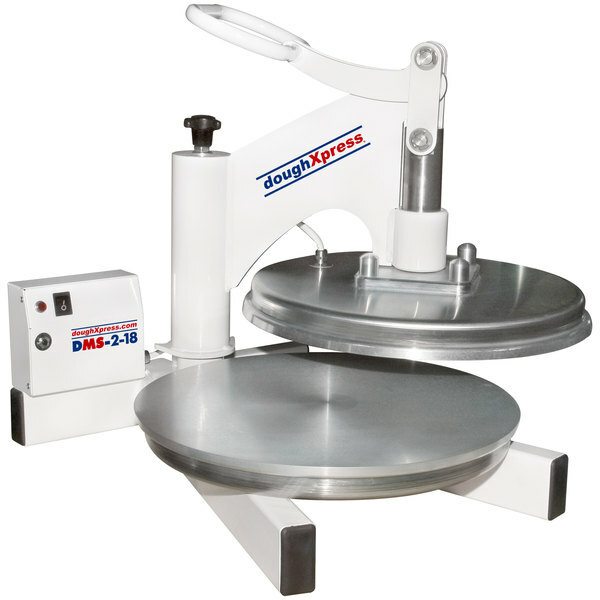 DoughXpress DXC-3 Mobile Cart - 21 1/4" x 30" x 25"
DoughXpress TXC-3 Mobile Cart - 23 1/2" x 26 1/4" x 27 1/4"
Perfect for producing consistent tortillas and airy pizza crusts, the Dough Xpress DMS-2-18 will help you achieve delicious 18" crusts in no time! The DMS-2-18 eliminates the need for messy flour, and its easy-to-use operation is safe to use for unskilled labor. Unlike dough rollers that require two passes through the equipment, the DMS-2-18 requires only a single press for faster production while resulting in a texture similar to hand tossed. This dough press is packed with features that make it a versatile addition to any kitchen. Integrated dual heated platens let you press thinner products, aid dough flow while keeping it from shrinking back, and allow the dough to be pressed immediately after removing it from refrigeration. Variable thickness control makes it possible to achieve virtually any desired thickness and ensures that same thickness throughout the dough. Its bottom swing-away design saves space, while the white powder coated exterior makes for a product that is both durable and attractive! It requires a 240V electrical connection for operation. This to press is perfect for pressing pizza and tortillas the only thing is is you will have to change out the plug depending on the electricity you have in your building.